Who would have thought it would be clear and in the mid-fifties for a late November evening bike ride in Detroit? 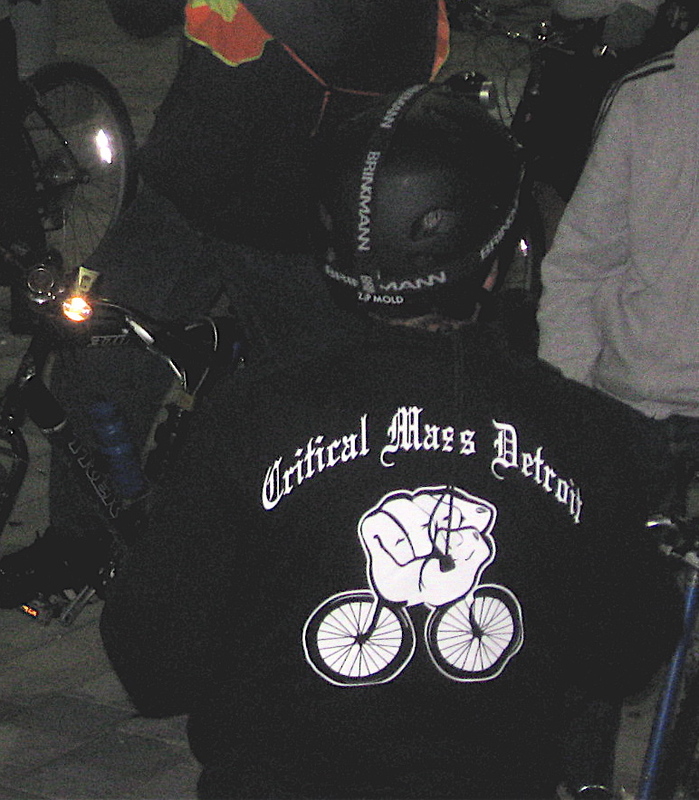 That was the case for the recent Critical Mass Detroit bike ride held this past Friday night. Only about 150 cyclists took advantage of the warm, dry weather by joining in on the ride; fewer than I thought there would be. 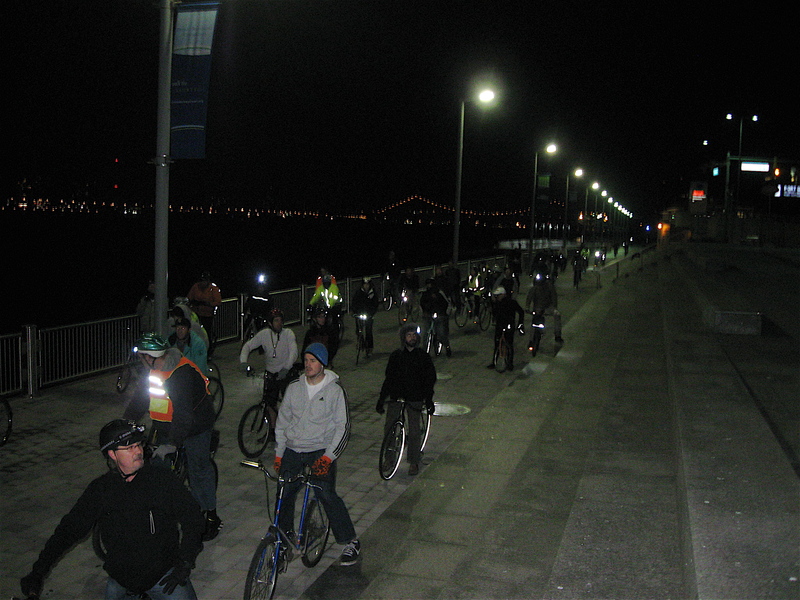 The pace was faster than many of the previous Critical Mass rides. Perhaps it was because of the smaller amount of cyclists. The evening’s route took us from Wayne State University (WSU), the starting point, through Southwest Detroit; on to Downtown Detroit where we jumped on the city’s riverfront walkway for about a mile. 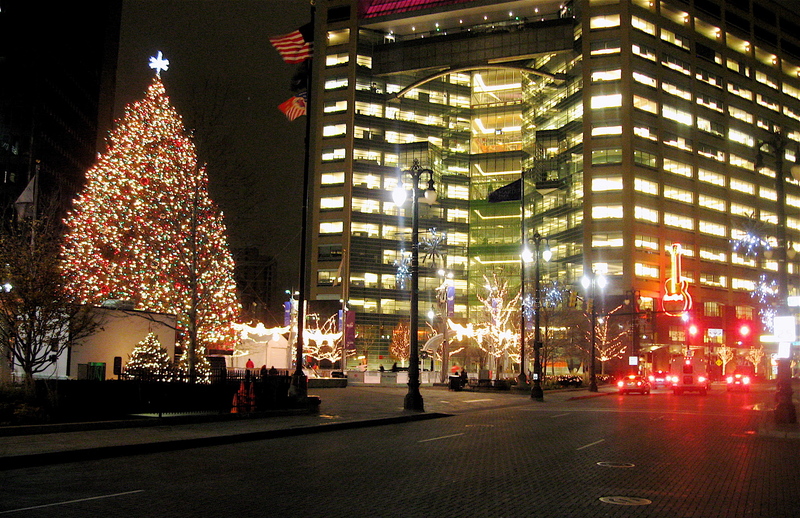 On the unplanned route, we sped past many of the city center’s gems, such as the Renaissance Center, Penobscot, Buhl, Ford and Guardian buildings, most of them decked out in holiday trimmings. We also made our way through The Dequindre Cut Greenway, a once abandoned rail way line that has been converted into a paved walkway with bike lanes. 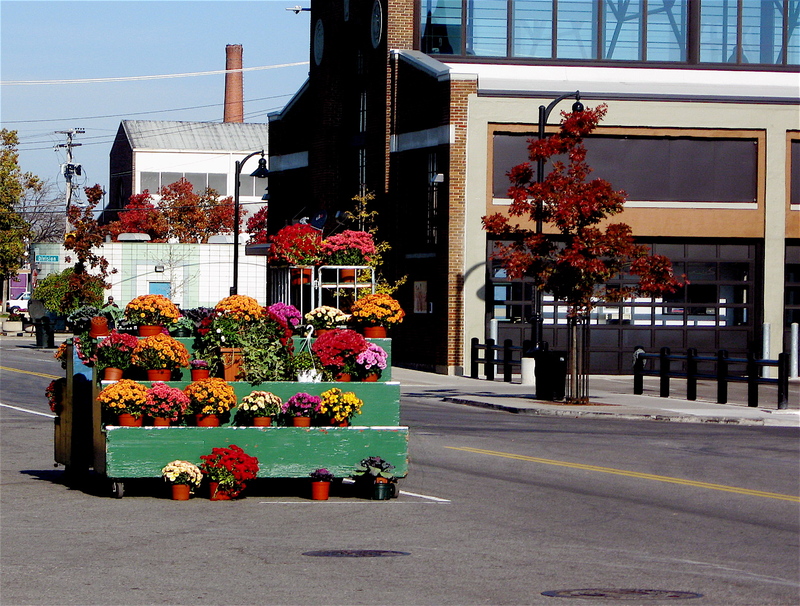 From the Cut we made our way over to and through the Historic Eastern Market, while on our way to Campus Martius Park in the heart of the city. We circled that cozy, urban park and caught a glimpse of the many skaters that were taking advantage of the warm evening. It was a gorgeous sight with the large, brightly lit Holiday Tree anchoring the south end of the park. From there we wound our way through a few side streets that led us to and past Ford Field (home of the Detroit Lions) before heading back to the ride’s starting point at WSU. Riding through the city I couldn’t help but notice there were a lot of people out. 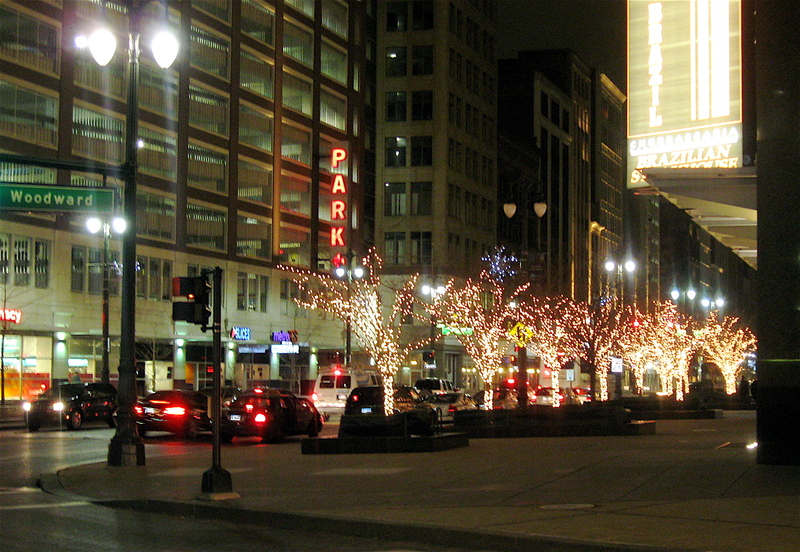 Perhaps they were black Friday shoppers or just folks out for a walk on a nice warm evening. It was most likely the cusp of winter’s inevitable arrival. Those we rolled past offered up smiles and friendly, encouraging waves. There is something about a group of 150 or more bicyclists that people seem to relate to and enjoy. Is this the last organized ride of the year for many of us? Perhaps. 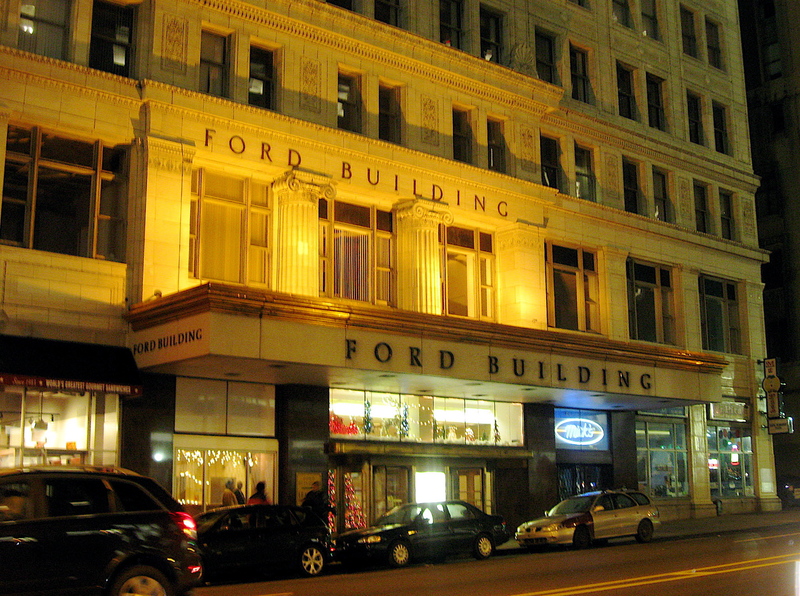 If so, it couldn’t have happened on a better late fall evening in Detroit. 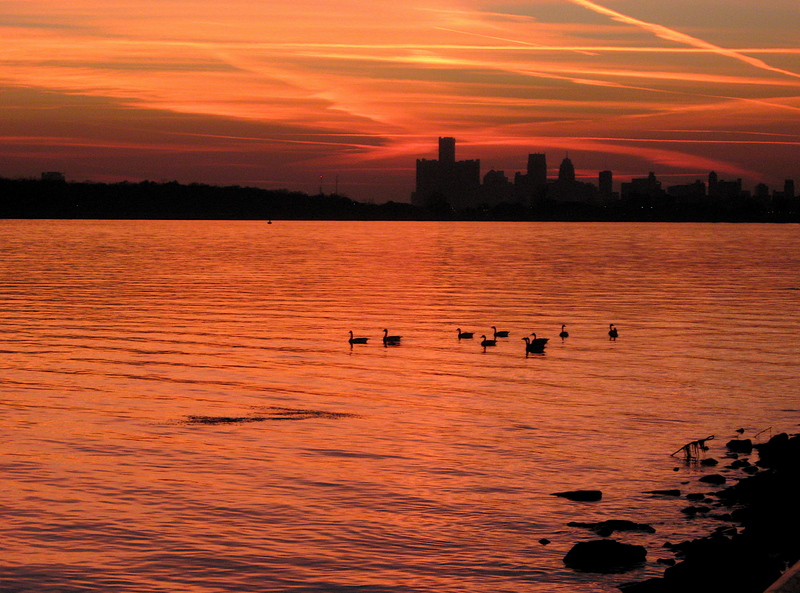 Belle Isle Park is located in the middle of the Detroit River. It’s a large park; close to 1,000 acres. Frederick Law Olmstead, the landscape architect that created New York’s Central Park, designed its current layout in the 1880s. On the south side of the island, Canada is across the river. The city of Detroit is on the north side. There is a road that circles the outer shoreline of the park. It is a 5-mile loop around, a leisurely ride on a bicycle. Other roads and woodland pathways snake their way through the center of the island, the largest park of its kind in the United States. 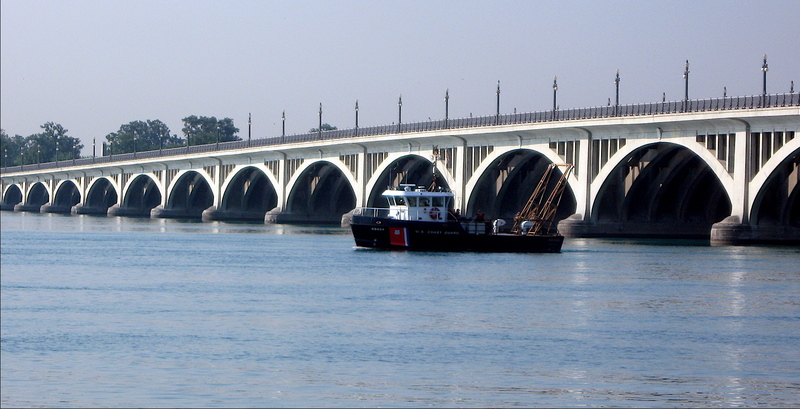 Connecting Belle Isle to Detroit is the MacArthur Bridge. 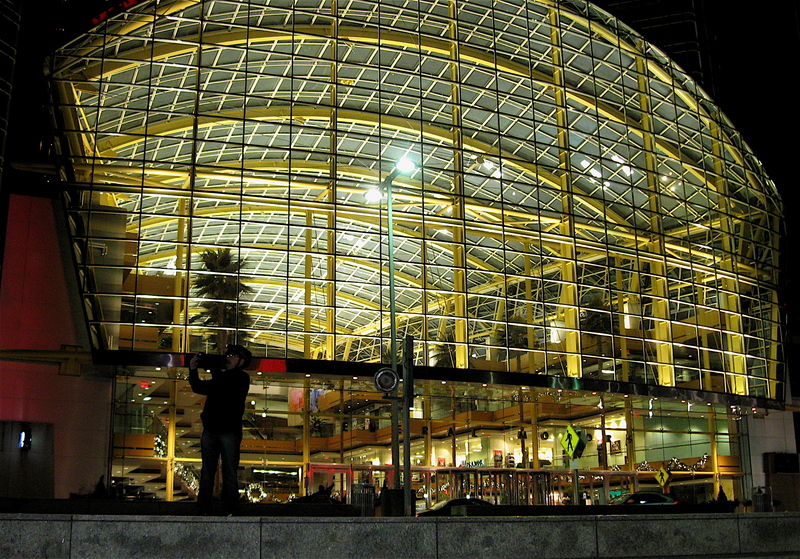 It consists of five-traffic lanes and pedestrian walks line the outer edge on both sides. The bridge, with 19 arches, was built in 1923. It rises gently from the mainland and crests at the center, before sloping down to the island. Driving across the half-mile span in a car, the rise seems subtle and gentle. Pedaling across the bridge on a bicycle is a much different story. As I found out early on while riding to the island, it is a formidable major climb and a true test of leg strength. 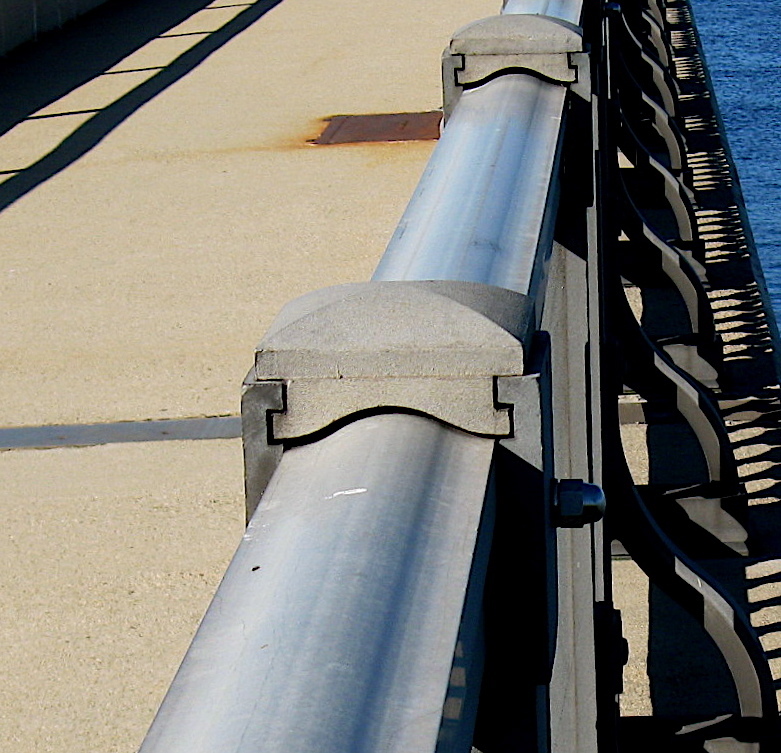 Having ridden across the bridge hundreds of times, I’ve never paid much attention to the four-foot pedestrian guardrails. That changed one recent afternoon. 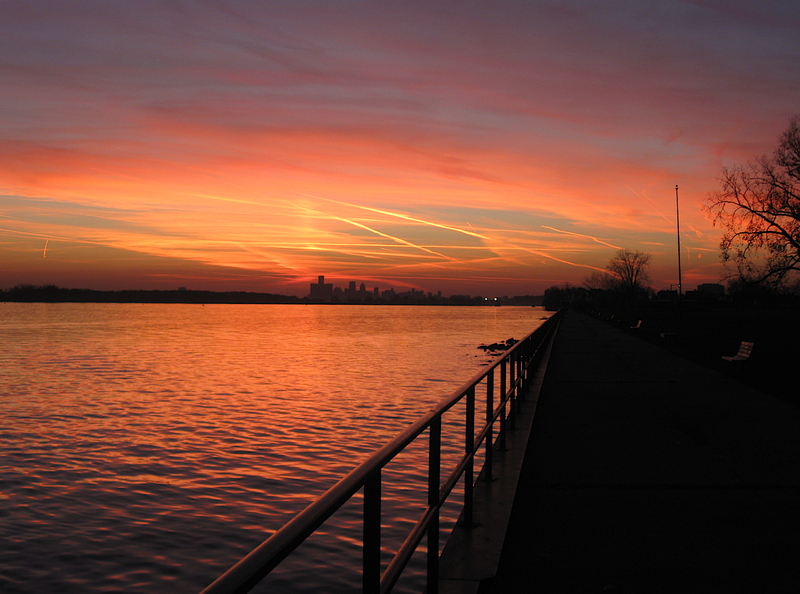 On that particular day, I was slowly pedaling along the west side walkway, enjoying the view of the Detroit skyline. 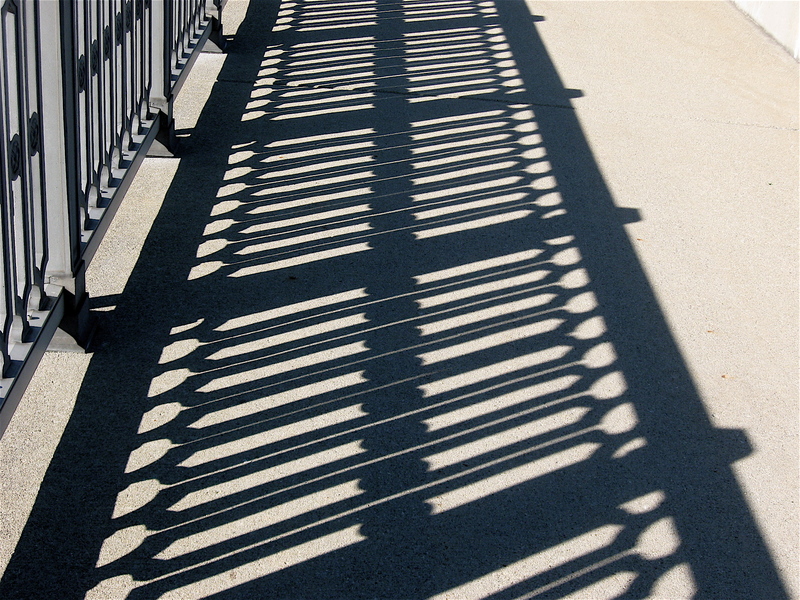 Rolling along, I noticed a shadow of the railing design framed on the sidewalk just ahead. The interesting black and white outline was symmetrically shaped and had unusual vertical lines. Because of what I saw, I decided to take a closer look. The unassuming railings and their support structure feature remarkable detail. 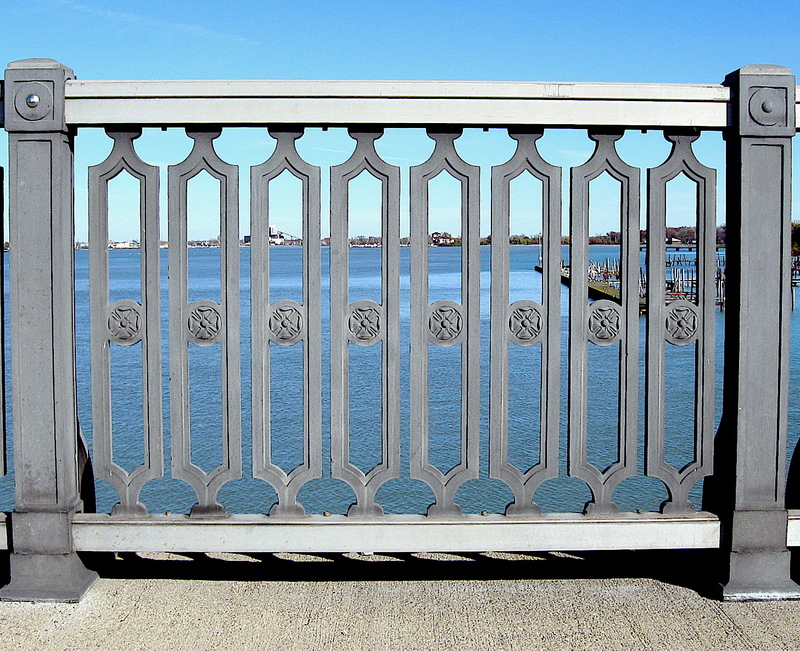 The long, horizontal, rounded top steel railings are locked into place by small caps that conform to the roundness of the rail. The vertical supports are evenly spaced and have small arches at the top and bottom. The arches seem to match those of bridge below. The open centers of the supports are stepped and come to a nice peak on both ends. The center of each features an architectural medallion similar to a four-leaf clover. 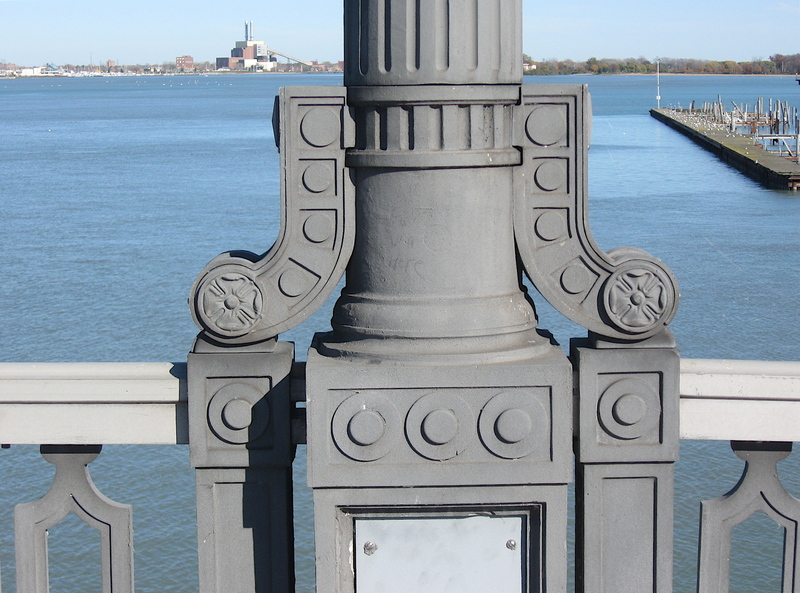 The hundred or so light poles lining the bridge are anchored with sloping “J” shaped decorative supports. The supports also incorporate the four-leaf clover piece and include simple round, ornate elements as part of the overall design. The light posts rest gracefully on the simply designed base that flows to the bridge below. Belle Isle is full of treasures, and I’ve overlooked this one for many years. 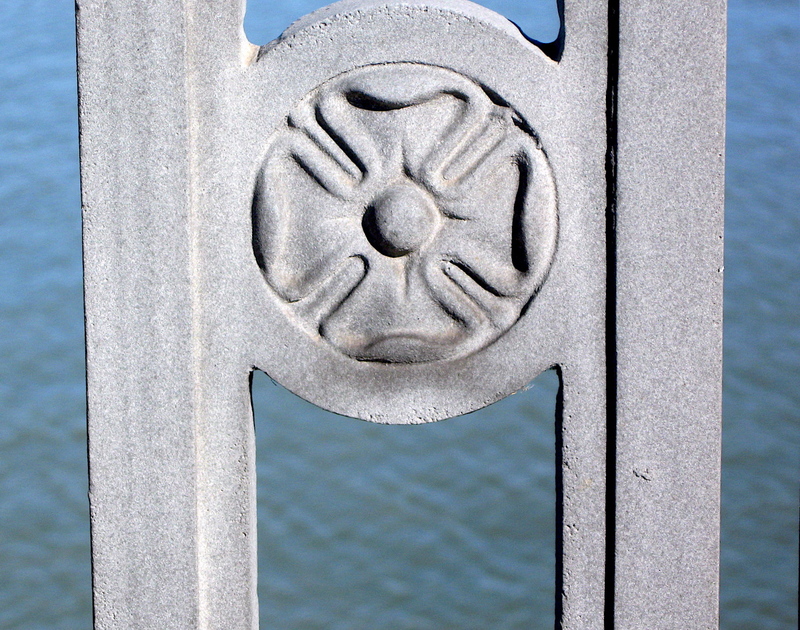 I recommend taking a close look at the railings next time you find yourself crossing the Belle Isle bridge. As I wrote in my five-part series on Detroit graffiti a while ago, the city has a significant amount of the colorful wall art. It seems to be everywhere, from abandoned buildings lining well-traveled roads and streets, to the far reaches of the neighborhoods. 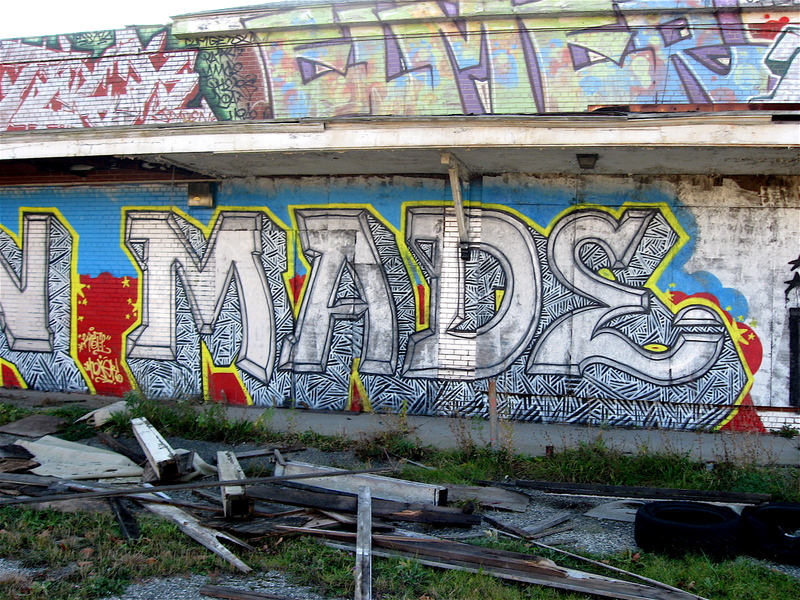 Once vibrant manufacturing facilities that have been abandoned long ago are hot beds for the street artists, as are buildings and walls found along railroad tracks that crisscross Detroit. The wall paintings come in a variety of forms and styles. Some are simple one line sayings, while others include a couple of colors, and many of the larger pieces can involve multi-colors weaved together like a fine, highly collectible tapestry. On my bicycle travels I’ve seen lively, bright caricatures and highly stylized, multi-colored names. There are political and street messages scrolled on walls, sides of buildings and other highly visible locations. 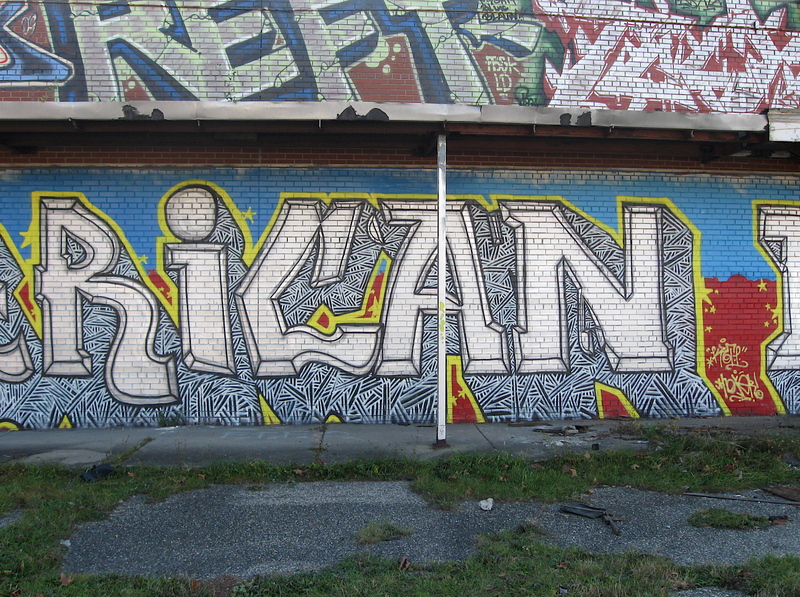 Many of the large, three-dimensional intricately designed masterpieces are generally found in galleries, which are areas of highly concentrated art of this type, such as the Dequindre Cut near downtown. One thing I have noticed while bike riding throughout the city over the years is how graffiti evolves and changes, much like multi-layers of mold found on a piece of discarded bread. A case in point is what I saw over a short period of time at the Packard Plant, a haven of graffiti in Detroit. I was there two weeks ago and came across a new, outstanding piece called American Made. The mostly black and white wall painting featured tall, stylized letters highlighted with black slash lines with yellow, blue and red accents. It was a lengthy piece (about thirty feet wide) spreading across the front of an abandoned grocery store on the property. I returned this past Sunday, exactly one week later, and to my amazement, the art on that wall had changed. 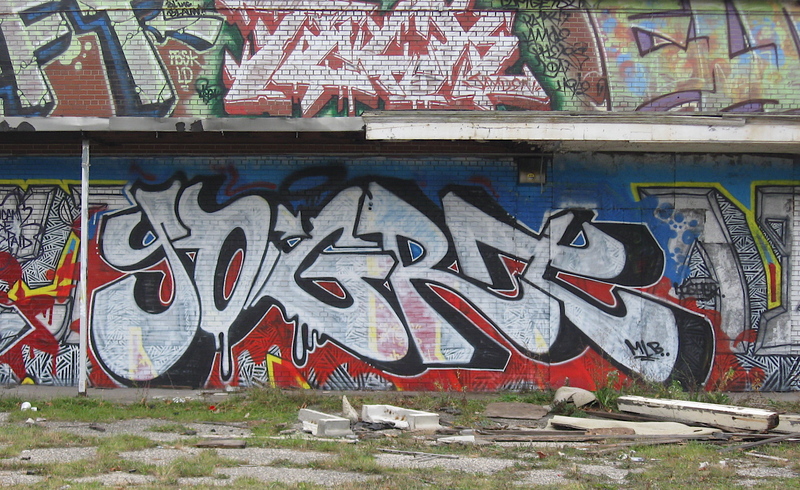 Ninety percent of the American Made painting was painted over with two somewhat common Detroit graffiti names: Eater and Yogrt. The two multi-colored, elaborate pieces now covered two major sections of the original American Made piece, basically destroying it. It’s not uncommon for graffiti writers to go over other’s work. However this cover-up surprised me because of the complexity of the newer pieces and quickness in which they appeared. I’ve seen many quick-hitting, single-colored tags scrolled across plenty of sophisticated graffiti writings on my travels, but nothing quite as dramatic as this. It makes me wonder what other stunning pieces of graffiti are buried beneath the paints on this wall and others near the Packard Plant and elsewhere across Detroit. This past early Sunday morning was crisp and clear in downtown Detroit. The bright fall sun was sparkling in the calmness of the Detroit River. The tall gray and brown office buildings offered a stark, interesting contrast against the cloudless blue sky above. The streets had little car traffic and a few bicyclists and runners were taking advantage of the carless streets by using them as their own private routes. 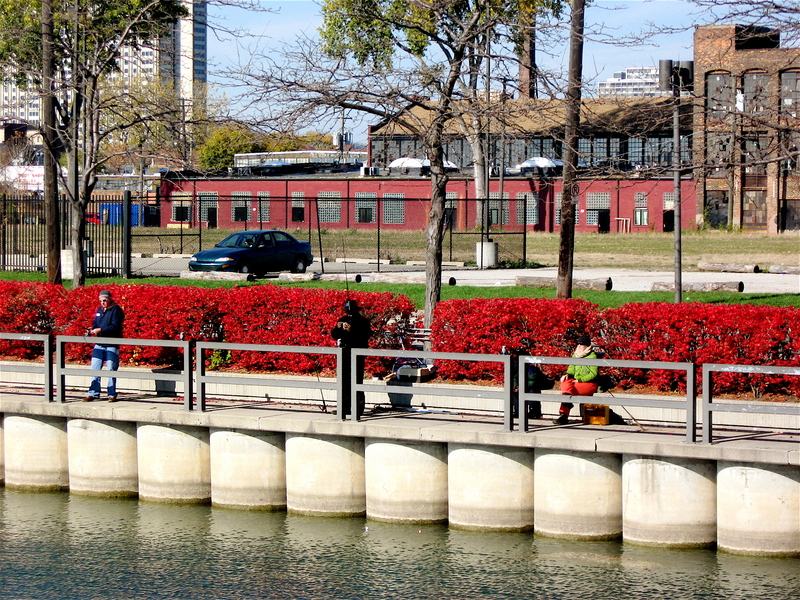 There were a few fisherman and dog walkers along city’s RiverWalk, but overall, that beautiful walkway nested along the river was quiet and pedestrian free. 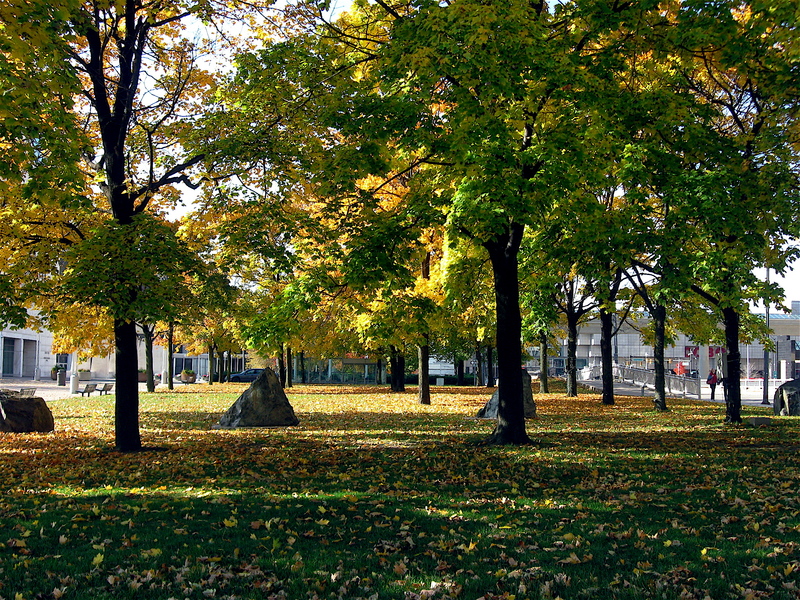 As I rode from the RiverWalk up through Hart Plaza on my way to downtown, I was struck by the vibrant gold, orange and yellow colors of the leaves that were still clinging to the trees that lined the Plaza. 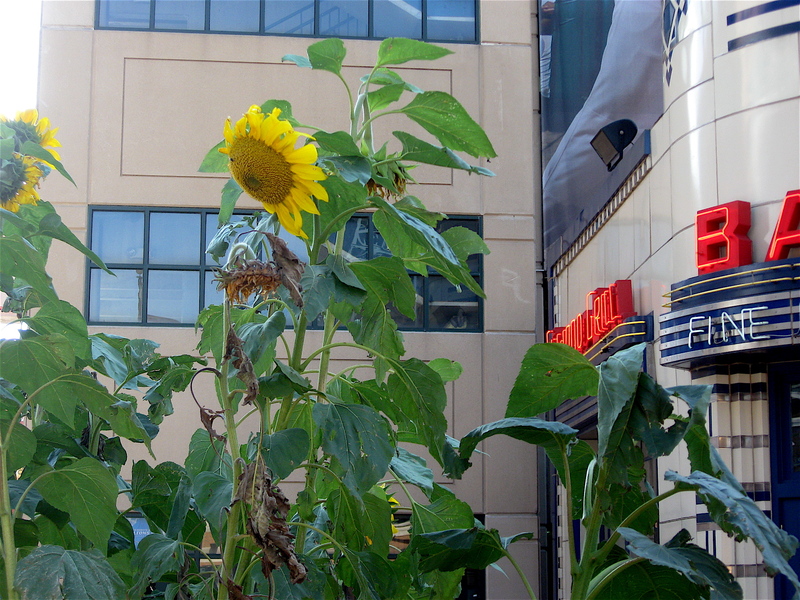 Those tough survivors of recent heavy rains and winds seemed to glow in the sunlight. There was a gentle breeze in the air and that slight, but steady wind made the leaves sway in rhythm, like a well-performed jazz piece. Those that had recently fallen created a bright, golden floor on the grass below. 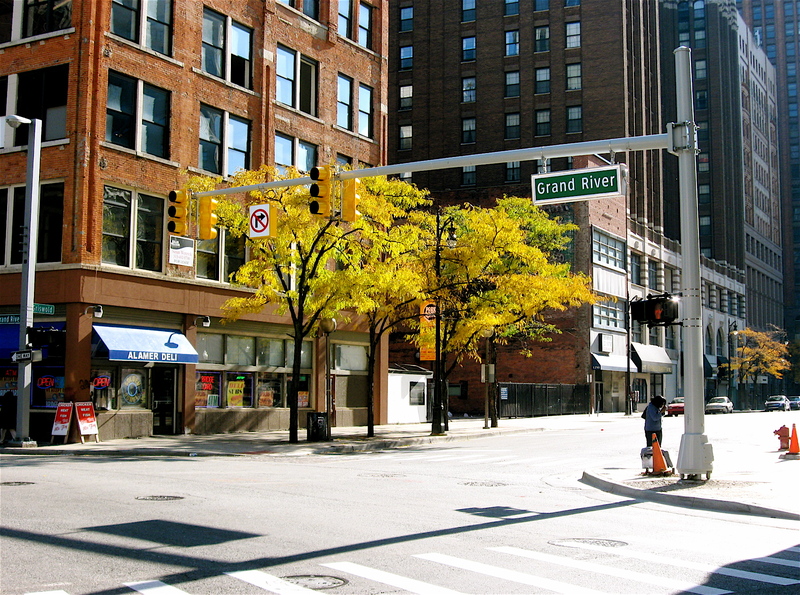 Rolling up Woodward from the Plaza and crisscrossing various downtown streets, I spotted countless medium-sized maples and other smaller, ornamental trees edging several of the sidewalks; like umbrellas found at an outdoor cafe. They too still had most of their leaves and were at their colorful peak. 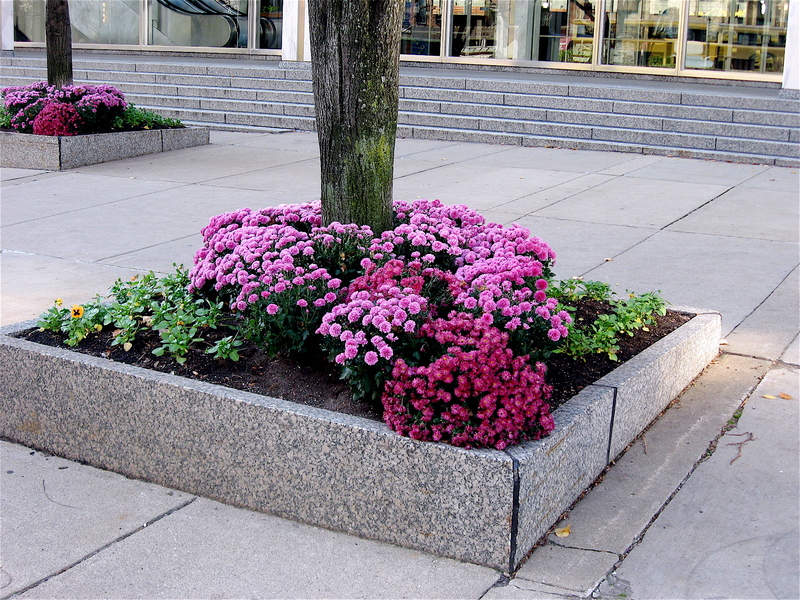 Some were planted in well-defined landscape cutouts and at their base, was a variety of multicolored seasonal mums. Even the Burning Bush plants I came across were holding on to their eye-squinting, fiery red colored leaves. 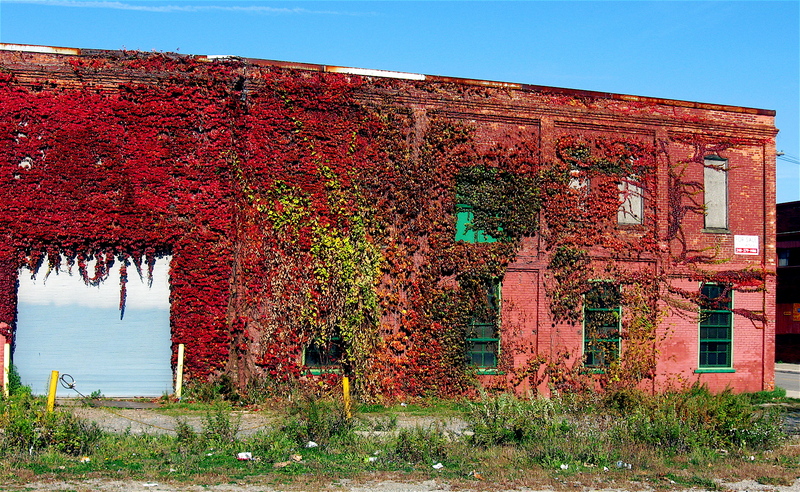 Quite a few of the older brick buildings in Detroit are covered with ivy plants. Their leaves had changed from the green hues of summer to fall’s red and gold, complimenting the vintage building’s reddish brick. 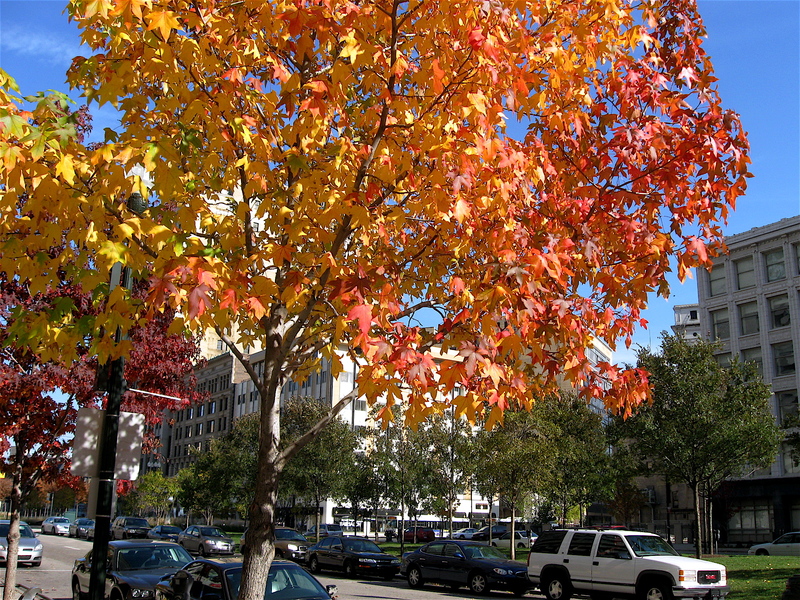 Although many the trees and shrubbery planted within city’s intricate freeway system have been stripped bare of their leaves from gusty wind and steady rains, there was still plenty of them holding their prime fall colored leaves. 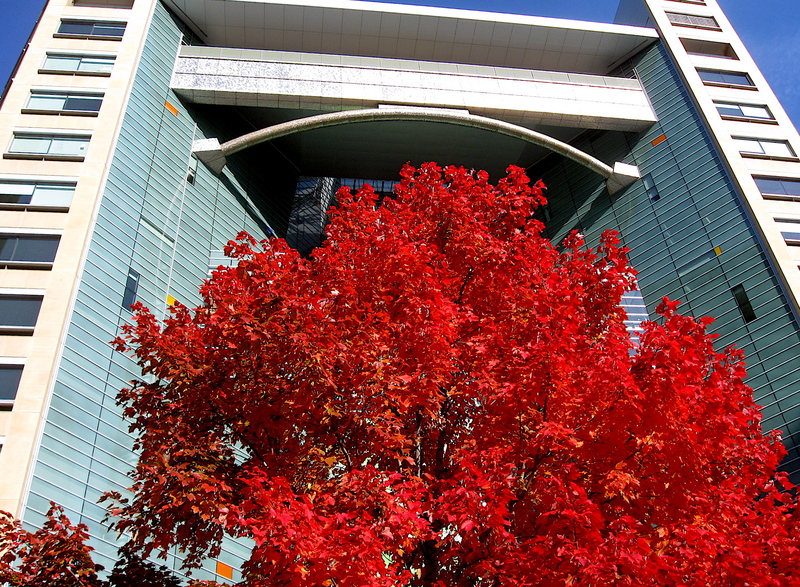 Yes, Detroit was ablaze with fall colors this past weekend. Unfortunately they will quickly fade and wither away as the late fall and winter seasons work their way in. Massive, gray billowing autumn clouds seem to hug the horizon this time of year. They roll and soar across the sky in many directions. In some instances, they appear to frame and highlight the beautiful bright colors of the leaves on the trees that look as if they were cleverly placed in front of them. As the evening sun sets behind the bulging, dark masses above, the sky and clouds can take on a range of golden orange and red hues. Much like the ever-changing colors of blazing logs in a campfire. Such was the case recently as I was riding my bike through Lakewood Park along the Detroit River in the city’s Creekside community. 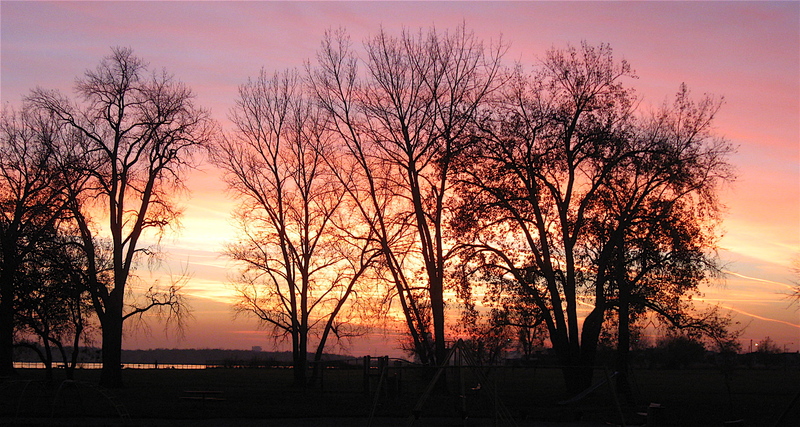 As I approached the river, I could see the colors in the sky were quickly changing as the sun was setting. Early on it was a gradual, subtle change from yellow to orange. Then the most incredible thing happened. Suddenly the sky turned to a bright, vibrant orange color and streaks of gold and yellow vapor trails appeared and crisscrossed the illuminated sky. Mixed into the array of reddish gold colors were purples and blues, creating a visual feast for the eyes. Not only was the western sky glowing in the bright, late evening fall sunlight, the Detroit river also came alive with the colorful reflections from overhead. Unfortunately, the sky darkens rather quickly this time of year, wiping away the beautiful colors of the sunset in an awfully short time. It was magical watching the vivid colors darken and fade away over the 20 minutes or so I spent in the waterfront park.